You guys, Portland totally fake-summered me. We had two weeks of glorious weather — 70 degrees every day with clear, cloudless skies. Not a drop of rain, and all the flowers and trees around town burst into bloom. Erlend went out and bought a bunch of starter plants and flowers for the garden, while I dug out my summer clothes and considered buying strappy leather sandals, even despite my fear of people thinking my toes are gross. And then just like that, the skies closed up again and pelted us with rain. We woke up to near-freezing mornings and Erlend grumbled about bringing his baby plants inside every night. I sadly hid away my colorful dresses and retreated back into my waterproof gray-and-black wardrobe. The weather forecast on my phone tells me that it's nothing but rain, rain, and even more rain for the next week. Yeesh. The lady I bought them from told me their official name, but I really can't remember it at all. In any case, they definitely add a much-needed cheer around my house. Because as usual, the house has been kind of a drag lately. I discovered a massive leak underneath the kitchen sink that's warped and gnarled the wooden cupboards beneath it. I've got a plumber coming in next week, but I have the sneaking suspicion that it's not going to be an easy fix. To make these mini cakes, I baked the cake in a quarter sheet pan and used a 5-inch cookie cutter to stamp out cake circles. I ended up with six cake circles and a TON of cake scraps. Which gave me pause — because, yep, there are a ton of mini cake recipes floating around on the internet at the moment. So... what does everybody do with their cake scraps?! Does everybody just throw them out?! Oh no, I can't bear to think of that. That seems like such a waste! So do we freeze them? Or save them for another baked good that's even cuter than mini cakes? Is there something that I'm missing here?! In the end, I ended up digging out my donut hole cutter and using that to punch out EVEN SMALLER CIRCLES from the scraps... to make petit fours! I'd been wanting to make petit fours for a long time now, but was intimidated by the fondant frosting that I typically associate petit fours with — I guess I had too many of Mr. Kipling's French Fancies when I was a little kid? I was initially hesitant to call my mini-mini cakes petit fours, but a quick search on Wikipedia reassured me that petit fours didn't necessarily have to be covered in fondant. Which meant that these stamped out mini-MINI cakes could legitimately be classified as petit fours! Now a quick note before I hand you the recipe: DON'T FEAR LAVENDER. 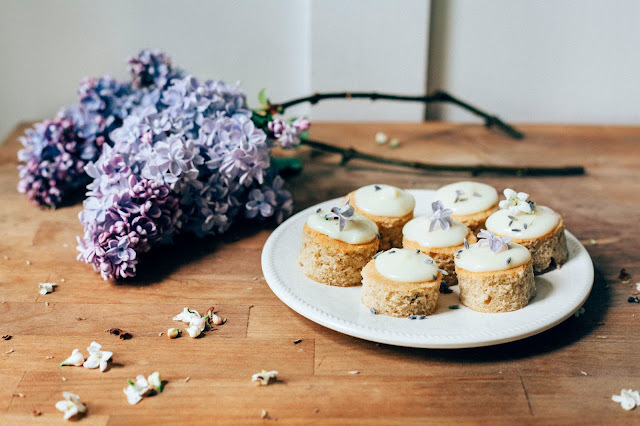 I know that a lot of people associate it with soap and perfume; others have had desserts that have erred on the side of too much lavender and therefore taste too much like soap. 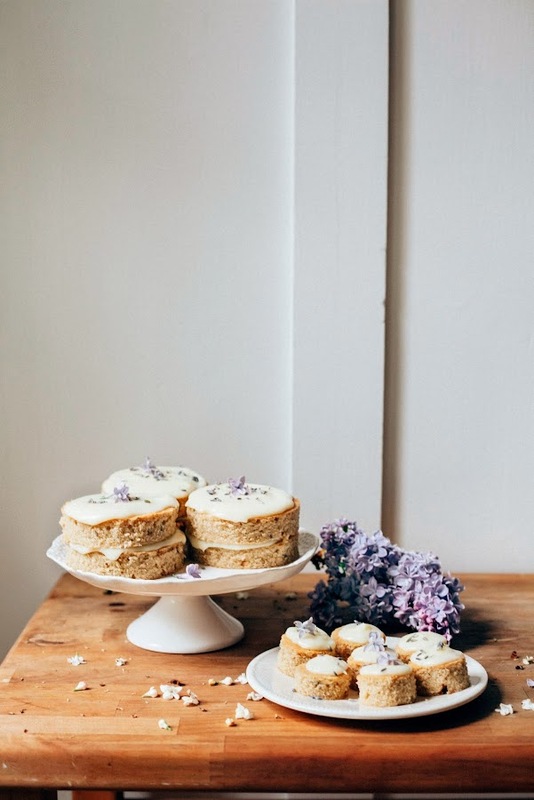 But if used in the right amount — that is, sparingly — lavender can be really lovely, adding a subtle floral and tea-like flavor to the dish. 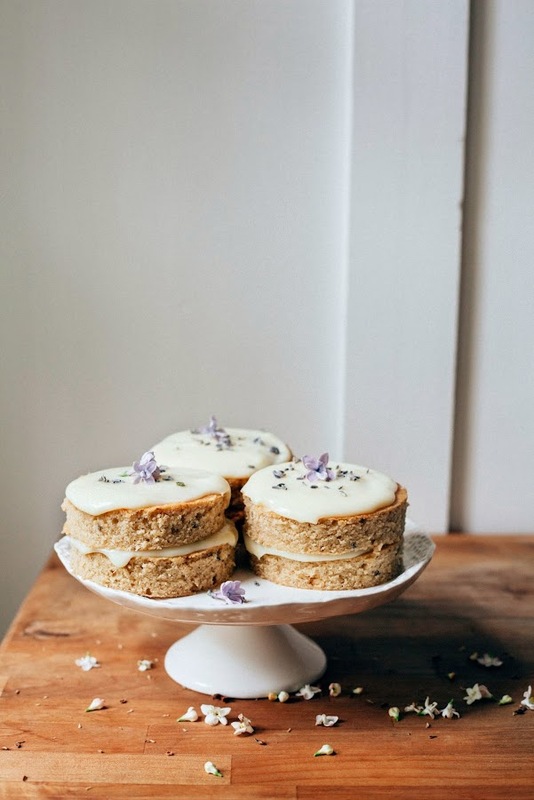 In this particular recipe, the lavender is balanced out by the addition of Earl Grey tea in the cake, as well as the lemon ganache. Culinary dried lavender is available online or in specialty tea or spice stores. I've also found it in the bulk and baking section of Whole Foods grocery stores. The batter is very unusual — when you've finished mixing it, it will seem like it's too thick and that something must have gone wrong. Don't worry! This texture is normal since it's a very dense cake with a heavy crumb. Use an offset icing spatula to spread it evenly across the pan. The lemon and white chocolate ganache contains gelatin to help it set, thicken and retain its shape. You can omit the gelatin if you'd like, but I'm warning you now that the ganache will be more similar to glaze than frosting. A lot of people are put off by the process of blooming gelatin, but it's a lot easier than it sounds. To bloom powdered gelatin, sprinkle it evenly onto the surface of cold water in a small cup. If you pour the gelatin into a pile on top of the water, the granules in the center will remain hard and will not bloom. Allow the granules to soften entirely in the cold water for a couple of minutes, but not so long that it becomes "overbloomed" and is so soft that it is falling apart. Make sure your cake is completely cooled before stamping out the mini cakes and petit fours! If you cut the cake when it's still warm, you won't get nice, clean edges and I will cry for you. In a medium, heavy-bottomed saucepot, combine 1/2 tablespoons loose leaf Earl Grey tea and 1 cup unsalted butter. Melt the butter over medium-low heat, using a heatproof rubber spatula to swirl the butter around to ensure even melting. Once the butter is completely melted, remove from heat and allow to cool on a wire rack for 10 minutes. Place a fine-mesh sieve over the bowl of a freestanding electric mixer and strain the tea leaves from the butter, using the rubber spatula to press gently on the tea leaves to get as much butter as possible. Discard the tea leaves and allow the infused butter to cool to room temperature or closeish. Center a rack in the oven and preheat to 350 (F). Prepare a 13 x 9-inch cake by spraying with cooking spray and lining the bottom with parchment paper. Spray the parchment paper with cooking spray as well. 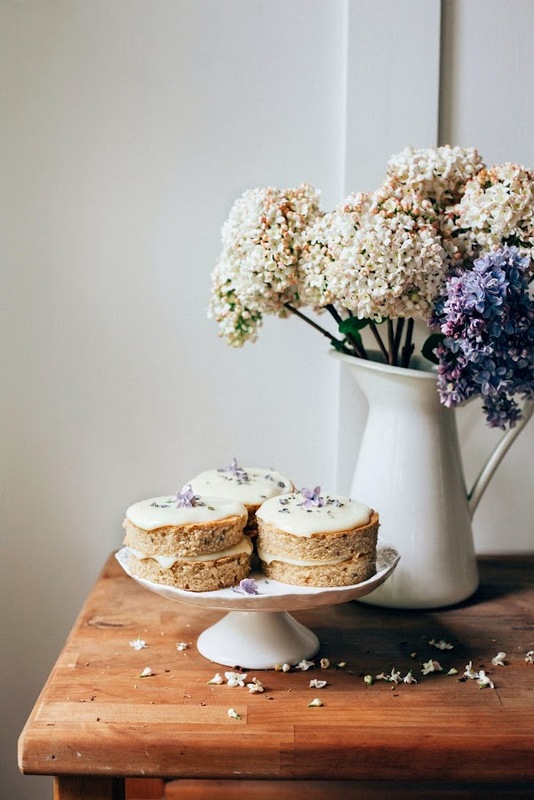 In a medium bowl, whisk together 1 1/2 cups all-purpose flour, 3/4 teaspoons dried lavender, 1/4 teaspoon plus 1/8 teaspoon baking powder and 1/4 teaspoon kosher salt. Set aside. Add 1 cup granulated sugar and 1 tablespoon light corn syrup to the freestanding electric mixer bowl containing the tea-infused butter (from the 1st step). Fit your stand mixer with a paddle attachment and cream the butter, sugar and corn syrup on medium speed until light and fluffy, about 3 to 5 minutes. Whisk together 3 eggs, 3 tablespoons sour cream, and 1 teaspoon vanilla extract in a liquid measuring cup, before pouring into the creamed butter and beating until smooth. Scrape the bottom and sides of the bowl and continue mixing until smooth. Turn the mixer on its lowest speed and add the dry ingredients (from the 3rd step) in three batches. Mix the dry ingredients until just incorporated, before adding the next batch. Once the dry ingredients have been mixed in, scrape the bottom and sides of the bowl before mixing for another 15 seconds. Scrape the batter onto the prepared baking sheet. It will seem like it's too thick, but spread it evenly across the pan with the offset icing spatula. Bake in the preheated oven for 25 to 30 minutes, until a skewer inserted into the center of the cake comes out clean and the cake bounces back when gently prodded with your finger. Transfer the cake to a wire rack and let cool completely before using the cookie cutters to stamp out the mini cakes and petit fours. First, bloom the gelatin. Sprinkle 1 teaspoon powdered gelatin over the surface of 1 1/2 tablespoons cold water in a small bowl. Let sit for 2-5 minutes, until the gelatin softens or "blooms". Put 5.5 ounces finely chopped white chocolate in a medium, heatproof bowl and set aside. Combine 1/2 cup plus 1 1/2 tablespoons light corn syrup in a medium, heavy bottomed saucepan. Heat the mixture just until it boils, whisking occasionally. Remove from heat and stir in the bloomed gelatin until it is completely dissolved. Pour the cream over the white chocolate. Use a heatproof rubber spatula to stir the mixture in one direction, concentrating on the center, until the ganache is smooth and glistening. Add 4 1/2 tablespoons unsalted butter and stir until the butter is completely melted. Once the butter is completely melted, add lemon zest and 1/4 cup fresh lemon juice and stir. Allow the ganache to set in the coolest part of our kitchen, stirring occasionally to release heat. It will seem like it's too thin, but it will thicken as it cools — be sure to use when it's still spreadable, about 45 minutes to 1 hour after you've made it. GIMME GIMME GIMME!!! and mini MINI cakes?? too cute to handle. like the donut holes of cake. OMG. Cake truffles! I totally forgot you had posted about this — utterly genius! These look so cute! Would be perfect for any Spring party. I must give them a go. 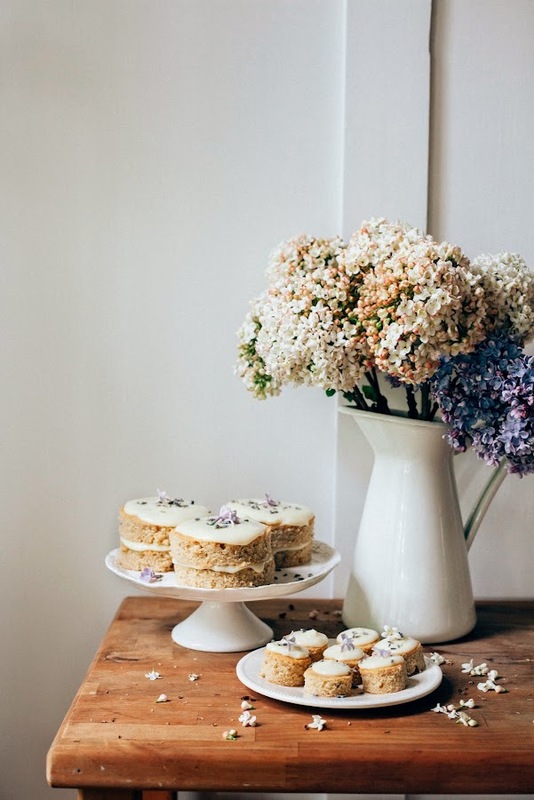 These are some of the prettiest little cakes I've ever seen (+ your photography in this post just totally slays me). So lovely! The flavors, the presentation - I imagine the lemon really adds such a wonderful brightness to the lavender and Earl Grey. A little girl's tea party dream come true! 2) Petit fours can be made without fondant?!?!?!?! CELEBRATE. 3) I just realized. That I am going to London. Home of high tea and petit fours (well also France). AND ALSO HUMMINGBIRD BAKERY!!! I am so gonna eat a cupcake in your honor. Finally, it is so unfair that Portland fake-summered you because these mini cakes SCREAM spring! (And like the prettiest part of spring, not the rain showers.) Love love love! These are some of the prettiest pictures of food I've ever seen. Just gorgeous. for whatever cake scrapes you might have leftover, you could make cake pops, which are admittedly démodé since mini anythings are all the rage right now but at least nothing would go to waste..
PS. i don't know why it's not accepting my wordpress identity. 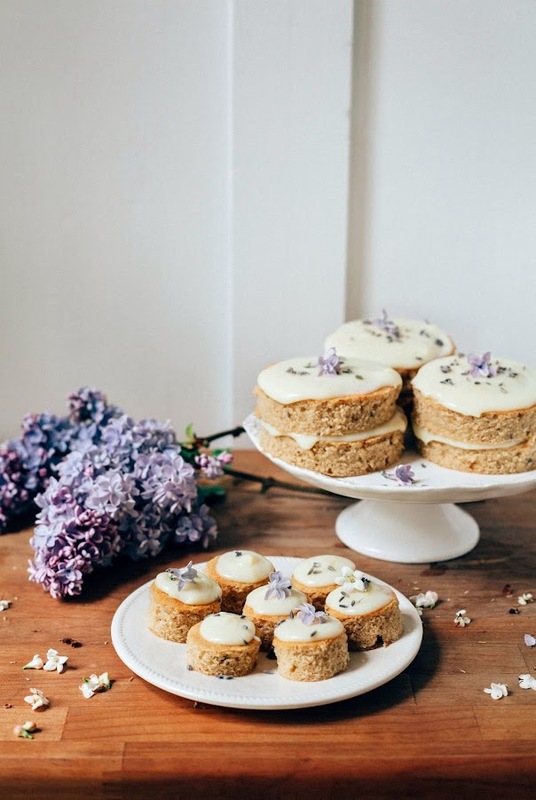 Gorgeous - especially love the lilac blossoms combined with earl grey! These are SO pretty! 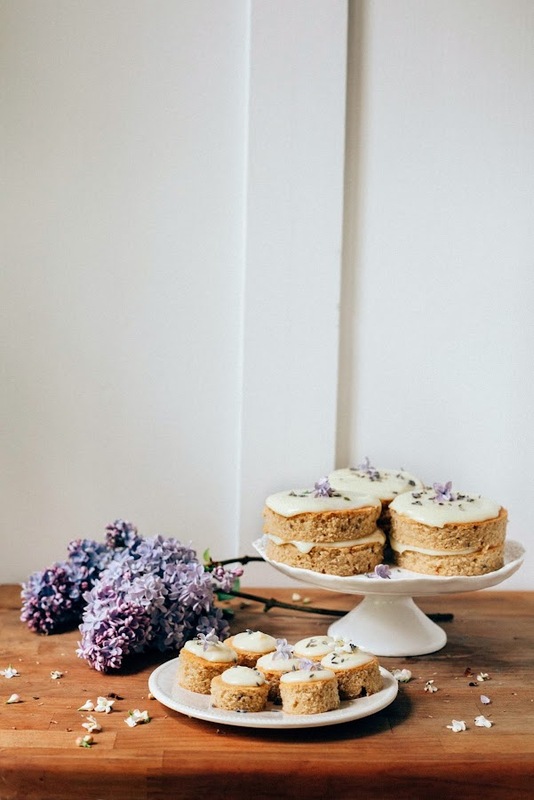 I love lavender with sweet things. I once made apricot and raspberry jams with lavender that was so good. 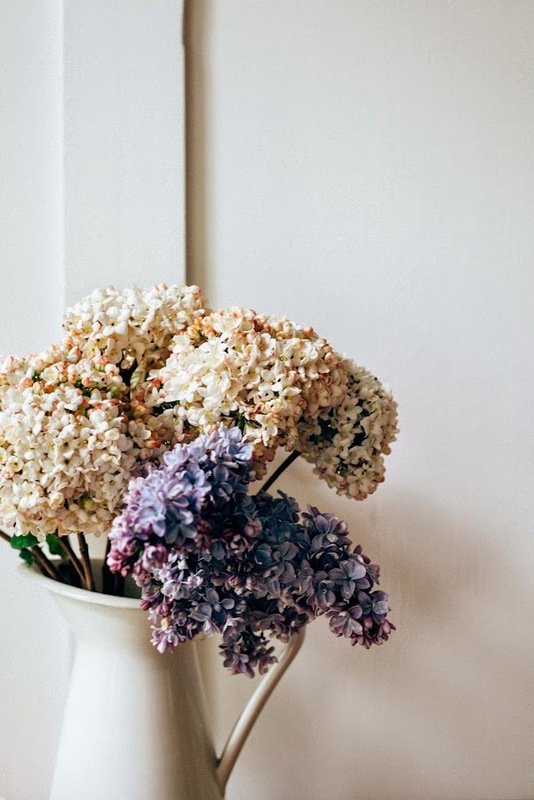 I am dying over those lilac blooms, too! I was so excited to see all of the flowers blooming and all the sunshine...I even made iced coffee. Then my family came to Portland and it rained the whole time, ha! I LOVE both lavender and bergamot, so this was the perfect recipe for me! I made the cake this afternoon after seeing your recipe in the morning :) I don't live in the States, so corn syrup isn't available; I used an equal amount of cane syrup instead. Instead of adding vanilla, I added bergamot extract, just to give it even more bergamot-goodness. I replaced the sour cream with crème fraîche since sour cream isn't sold where I live. For the lavender, I almost always infuse lavender into sugar when I'm using it, and I did the same for this: I put the 1 cup of sugar in my mixing bowl, added 1.5 teaspoons culinary lavender to the sugar, stirred it, and let it sit around for 30 minutes or so. I didn't bother removing the lavender buds as I like a pretty strong lavender taste. After baking the cake, I was able to cut 8 4-inch circles out of the sheet, which are now hanging out in the freezer to await an upcoming dinner party. The rest I've turned into cake balls (I made a bergamot butter cream, added it to the left-over crumbled cake, formed into golf-sized balls, popped them in the fridge to set, then dipped in melted dark chocolate). I think I will make the bergamot butter cream for the 4 inch cake rounds as well, though I'm sure your lemon chocolate ganache is lovely. FYI, I found your site via Food52. I agree, it`s totally okay, if they`re in mini forms. Plus, they up their cuteness factor! I'm making it now but don't see when to add flour. Winging it with step 4. Am I right? It's in there — step 6. Thanks! Except that step 6 references the dry ingredients from step 3. Anyhow, it all worked out. Just took them out of the oven (used muffin tins). What a great cake!